SemiLEDs Corporation had an incredibly strong day in the market. I mean, more than 200% growth kind of strong! The reason for the gains is that a known expert purchased a massive amount of shares in the company with a premium. Today, we’ll talk about the announcement, how the market reacted to the news, and what we can expect to see from LEDS stock moving forward. As mentioned above, SemiLEDS had a great day in the market today, and for good reason. Dr. Peter Chiou made the decision to purchase a massive amount of shares in the company. The 577,000 shares of the stock that were purchased today by Chiou represent about 19.6% of the total number of outstanding shares. This was a massive purchase. The price paid per share came in at $5.00, which represented a decent premium from the previous close. The company also said that Dr. Chiou intends to subscribe to a $1,615,000 0% interest convertible note. The note will have a maturity date of September 29th, 2017. 1st Installment – The first installment of $1,000,000 has already been wired to the LEDS bank account. 2nd Installment – The second installment of $1,885,000 will be wired to the company on or before August 15th, 2016. 3rd Installment – Finally, the third installment of $1,615,000 will be wired to LEDS no later than September 29th, 2016. Once Dr. Chiou provides all payments, completing the share purchase, he will be appointed as a member of the Board of Directors. The company also announced that Dr. Chiou has waived any earnings he would have generated as a member of the Board of Directors. As investors, one of the first things that we learn is that the news moves the market. Any time news is released with regard to a publicly traded company, we can expect to see movement in the value of the stock associated with that company. In this case, the news surrounding SemiLEDs is overwhelmingly positive. Not only will the company financially benefit from the sale of the massive amount of shares, it will benefit from a new Board member that comes with no payroll. 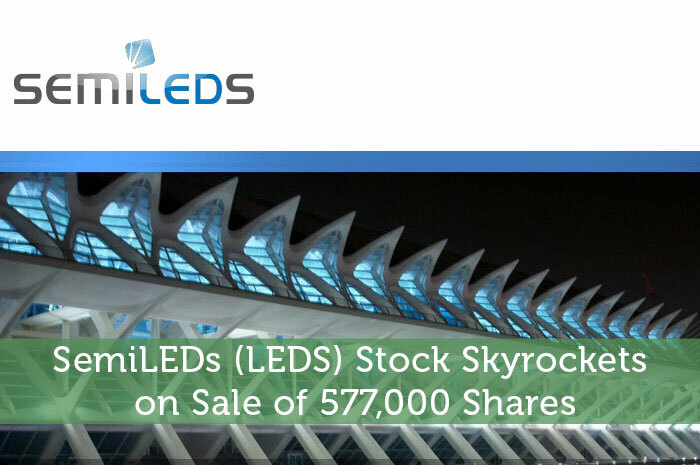 As a result, we saw incredibly strong gains in the value of LEDS in today’s trading session. By the end of the session, the stock climbed $6.90 per share or 212.31% to close the day off at $10.15 per share. Moving forward, I have a relatively mixed opinion of what we can expect to see from LEDS. First and foremost, it’s important to remember that market movement tends to happen through a series of overreactions. After such strong gains today, we can expect to see a slight correction starting tomorrow, which should bring the stock down to a more sustainable rate. Nonetheless, in the long run, I’m expecting to see gains out of SemiLEDs. The company continues to add new customers. In fact, they recently signed an agreement with a large regional retail chain. Under the agreement, the company will be installing lighting systems in several retail locations. As LEDS continues to make the right business moves, leading to growth, it is likely to continue gaining attention of big time investors, let alone exciting the masses. All in all, I’m expecting to see gains from the stock moving forward. Where do you think LEDS is headed moving forward and why? Join the discussion in the comments below!